WITH DEFENSIVE sectors being the flavour of the season, there is value to be made at the bottom of the pyramid in the small-cap segment. Jyothy Laboratories is a prime candidate in this category. Offering a cashgenerating consumer business, along with modest growth, it is a promising bet for investors eyeing the small-cap space. Incorporated in 1992, Jyothy Labs (formerly a private limited company) manufactures and markets household products under segments like fabric care, insecticide and dishwash detergent. Some of its leading brands include Ujala, Maxo, Exo, Jeeva and Maya. A strong brand equity, wide distribution network and focus on rural markets have been the company’s strengths. It has a strong sales force of 1,500 people servicing 2,500 distributors across India. Its flagship brand Ujala, a liquid fabric whitener, enjoys 69% market share in its category. Its insecticide brand Maxo has grown to command a 22.3% market share by value. The Ujala range of products in the fabric care segment comprises around half of the company’s revenues; Maxo contributes another 34%, while Exo makes up 11%. The company also has joint ventures with CCL Products and Balajee Telebrands to market and distribute their respective products, viz coffee and dhoop (incense). Recently, the company acquired trademarks rights of ‘More Light’ and ‘Ruby’ in the fabric whitener category. More Light is being targeted at the lower end of the fabric whitener category, while Ujala will be positioned as a premium brand. Historically, the company has developed brands that have grown from being leaders in regional markets to strong national brands. Revenues from Ujala are growing at 8-9%, from Maxo at 9-10% and those from Exo (which is still a regional brand selling in South India) at 30% annually. ompany is not keen on aggressively pushing into the highly competitive market of washing powders, the other product Ujala Stiff & Shine has witnessed a 50% growth in volumes since its nationwide launch this April. The company has currently stalled plans to launch Exo across the country due to uncertainty with regard to its input prices. unch of this service in the IT-BPO hub of Bangalore. While the service is not the first of its kind in India, the timing seems to be right, given rising urban prosperity and increasing incidence of double-income households. Jyothy Labs is a cash-rich zero-debt company with sound financials. 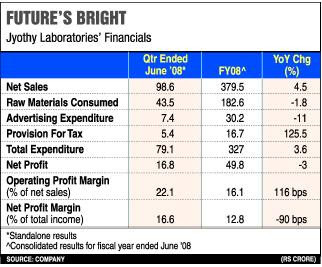 Its gross sales have grown at compounded annual rate (CAGR) of 8% since ’03 to reach Rs 465.5 crore in FY08. The net profit during the same period jumped over 39% to Rs 50 crore. s 28 crore and Rs 34 crore, since the past three years. The nationwide launch of Exo is likely to further increase this proportion by 1%. Currently, a major part of its sales promotion is in the form of trade discounts. In FY08, trade discount constituted 13% of its gross sales. The management expects to gradually reduce trade discounts and replace them with advertising in terms of brand building. For FY08, Jyothy Labs’ net profit suffered due to an increased tax burden. Incurring a capex of Rs 120 crore, it has now established five new facilities in tax-free zones. As a result, the company’s effective tax rate is likely to come down to 12% from the erstwhile 24%. To increase profitability, the company is also shifting to in-house manufacturing against outsourcing. After the increased capacity, the company expects to source only 20% of Maxo’s production from third parties. Although the company has diversified into other products, it largely depends on its two main products — Ujala and Maxo. Maxo, one of its most promising products, suffers from seasonality. The peak period of its sales is between February and May. For instance, this year, the company’s revenues and profitability suffered due to an extended winter. The company has an earnings per share (EPS) of Rs 36.4. With a lower tax burden, new product launches and increasing market share, the company aims to grow by 20% year-on-year to achieve a turnover of Rs 558 crore by ’09. Accordingly, considering its estimated earnings for FY09, the company is currently trading at a forward P/E multiple of eight times.